In 1919, Coalville Amateur Operatic Society (CAOS) staged their very first production, Ben Hur, at the Olympia Theatre in Coalville. Although the Olympia no longer remains, the society is still going strong, staging annual musical productions and entertaining audiences. Coalville has seen many changes over the last century, yet CAOS has been a constant throughout them all. 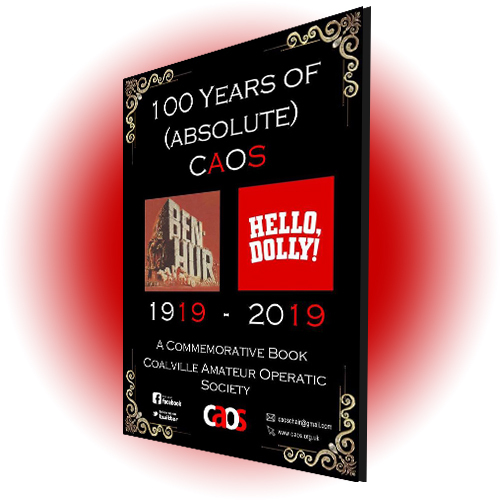 CAOS is extremely proud to be celebrating is centenary year; a society that is moving from strength to strength, staging more ambitious productions each year. Many families and friends have been at the heart of CAOS and its rich history. This commemorative book aims to provide an affectionate reflection of the last ventury, with member’s memories, photo’s and reminiscences. As a society, we look forward to the next 100 years. Books are available for £5.00 each which can be purchased via one of our members, at the theatre during our Concerts & Shows or you can pre-order one along with your online booking when you order tickets through the website.